The U.S. Congress has done a fair amount of “investigating” in recent years and very little has come of the investigations. Some people wonder why, during Republican control of one or both houses of Congress, this “check” on the other branches of government has done so little to uncover instances of illegal or unethical behavior and punish or refer such behavior for prosecution. In fictional works, or in true stories of olden times, Congress conducts meaningful investigations, and that’s where a Jack Bauer or Jack Ryan go to spill the beans. But today, the role of Congress has evolved, as shown in the above infographic. I’ve heard rumors that House and Senate “hearings” are public displays that Congress has no intention of allowing to proceed to any form of punishment, but are held merely to satisfy quaint notions of rule of law until the next season of The Bachelor begins — but such cynical ideas are impossible to accept. What I do know is that people often have the wrong impression of the modern role of Congress, and therefore have unrealistic expectations when there are cases of apparent malfeasance by members of Congress, or within some federal agency or the White House itself. People may have seen too many movies, where the congressional hearing is the grand inquisitor; where the whistleblower or rogue spy in days of yore could start the wheels of American justice turning. This is why hearings in the House or Senate are less like a courtroom and more like a weak homeowners’ association design review board. If someone gets called to a hearing, they can refuse to talk or just laugh at the panel — “I’m keeping my green garage door” or “so what if I broke a few laws” — and then it’s over and presumably they all go out for drinks. 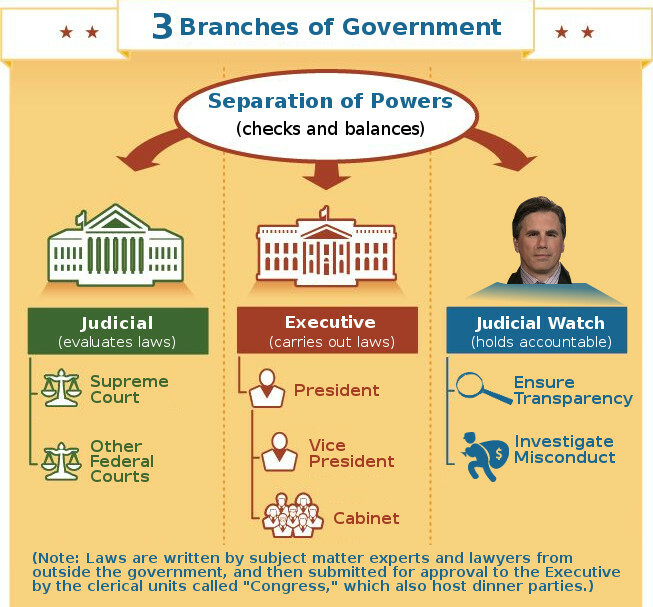 The checks and balances role once filled by Congress is now conducted by Tom Fitton and Judicial Watch, but you probably already knew that.